which I've always wanted so I stopped. It was pink. And a ten speed. In really good condition. My dream bike. The guy sold it to me for $5. It was the happiest find in my life. 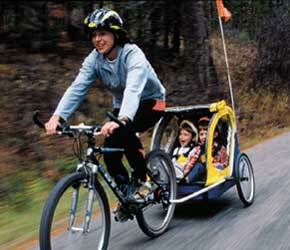 Now I had to buy one of those baby bike trailers for Saphira. (See picture). But I never have a hundred dollars so while I was waiting to come up with that money I had to come up with something else to carry her. So I put my hiking backpack on and rode with her on my back. And it turns out that I like it! So I don't need to buy a trailer. It looks unusual. I imagine I'm the only person in a hundred mile radius doing this. But I bet in other countries it's a common practice. Plus I'm not riding on trails so in the city there's lots of turns and busy streets. I don't know how easy a bike trailer is to maneuver, but basically I'm very glad I couldn't buy one and didn't buy one. I was telling Timmy that I like it much better and I said that the trailer drags behind you so a car could hit it or something and "if my baby dies, I want to die with it". And Timmy said that we should sell them as bike packs and that would be our tag line. He cracked me up with that one. I was breastfeeding Saphira at the beach yesterday, covering us with a towel. There was this father/body builder sitting about 20 yards in front of me, facing me and he kept staring at me. It was creepy. I joked with my mom "maybe he's a lactivist". "Aren't thay all?" she replied. ha ha. Today I walked to the corner store to buy some eggs because I was craving french toast on the one day we are out of eggs! Isn't that how it always is. (See my post on how cities should be designed, including the importance of corner stores). When I got there I saw fajita wraps that I wanted and Saphira wanted a banana and a teenie for her and her brother (isn't that sweet). It came to $6.25 but I only had $5.. So I was going to put the fajita wraps back but then the guy said it was OK I could take it. I told him I'd pay him back next time but he said I didn't have to (I still will). I thought that was so awesome. So if you're ever in the area be sure to buy something from Los Amegos. (What an appropriate name)! It's a family business. We gotta support those, ya know? Especially when they are good people like that.